Mighty Ducks primary logo (1993–2006). The logo was subsequently used in the Disney movie D2: The Mighty Ducks. Disney design elements appear in this logo, such as team mascot Wildwing's goalie mask. The Mighty Ducks of Anaheim were founded in 1993 by The Walt Disney Company. The franchise was awarded by the NHL in December 1992, along with the rights to a Miami team that would become the Florida Panthers. An entrance fee of $50 million was required, half of which Disney would pay directly to the Los Angeles Kings in order to "share" Southern California. On March 1, 1993, at the brand-new Anaheim Arena – located a short distance east of Disneyland and across the Orange Freeway from Angel Stadium – the team got its name, inspired by the 1992 Disney movie The Mighty Ducks, based on a group of misfit kids who turn their losing youth hockey team into a winning team. Philadelphia-arena management specialist Tony Tavares was chosen to be team president, and Jack Ferreira, who previously helped create the San Jose Sharks, became the Ducks' general manager. The Ducks selected Ron Wilson to be the first head coach in team history. The Ducks and the expansion Florida Panthers team filled out their rosters in the 1993 NHL Expansion Draft and the 1993 NHL Entry Draft. In the former, a focus on defense led to goaltenders Guy Hebert and Glenn Healy being the first picks, followed by Alexei Kasatonov and Steven King. 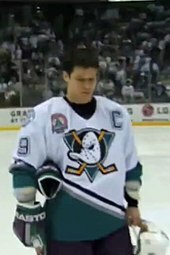 In the latter, the Ducks selected as the fourth overall pick Paul Kariya, who only began play in 1994 but would turn out to be the face of the franchise for many years. The resulting roster had the lowest payroll of the NHL at only $7.9 million. Led by captain Troy Loney, the Ducks' finished the season 33–46–5, a record-breaking number of wins for an expansion team, which the Florida Panthers also achieved. The Ducks sold out 27 of 41 home games, including the last 25, and filled the Arrowhead Pond to 98.9% of its season capacity. Ducks licensed merchandise shot to number one in sales among NHL clubs, helped by their presence in Disney's theme parks and Disney Stores. The lockout-shortened 1994–95 NHL season saw the debut of Paul Kariya, who would play 47 of the team's 48 games that year, scoring 18 goals and 21 assists for 39 points. The Ducks had another respectable season, going 16–27–5. 1995–96 would mark a big change for the team, especially for second-year superstar Paul Kariya. During the season, he was chosen to play for the Western Conference in the 1996 NHL All-Star Game as the lone Ducks representative. At the time of his selection, (January 1996), Kariya was ranked 14th in league scoring with 51 points (23 goals and 28 assists) over 42 games, although the Ducks were overall a low-scoring team. Then a mid-season blockbuster deal with the Winnipeg Jets improved the franchise. The Ducks sent Chad Kilger, Oleg Tverdovsky and a third-round pick to the Jets in return for Marc Chouinard, a fourth-round draft pick and right winger Teemu Selanne. Following the trade, Ducks center Steve Rucchin commented, "Paul [Kariya] had a lot of pressure on him... He singlehandedly won some games for us this year... Now that we have Teemu, there's no way everybody can just key on Paul." These three players formed one of the most potent lines of their time. Although the trade proved to be an important effort in the team, they still finished short of the playoffs, losing the eight spot in the Western Conference to the Winnipeg Jets based on the number of wins. During the 1996–97 season, Kariya became team captain following Randy Ladouceur's retirement in the off-season, and led the Ducks to their first post-season appearance after recording the franchise's first winning record of 36–33–13, good enough for home ice in the first round as the fourth seed against the Phoenix Coyotes. The Ducks trailed 3–2 going into Phoenix for Game 6. Kariya scored in overtime to force the franchise's first Game 7, which they won. However, in the second round, they lost to the eventual Stanley Cup champions the Detroit Red Wings in a four-game sweep. After the season, Ron Wilson was fired after saying he would like to coach the Washington Capitals. Pierre Page succeeded him. The Ducks started out slowly in 1997–98, in part because Kariya missed the first 32 games of the season in a contract dispute. He came back in December, but on February 1, he suffered a season-ending concussion when the Chicago Blackhawks' Gary Suter cross-checked him in the face. With Kariya playing only a total of 22 games that season, the Ducks missed the playoffs and fired Page. The Ducks followed that season up by finishing sixth in the Western Conference in 1998–99 with new head coach Craig Hartsburg. However, they were swept by Detroit again, this time in the first round. In the 1999–2000 season, the Ducks finished with the same amount of points as the previous season, but a much more competitive Western Conference had them miss the playoffs by four points behind rival San Jose Sharks. Despite this, the Mighty Ducks scored more goals than the conference champion Dallas Stars. In the following season, 2000–01, the Ducks ended up performing worse, as Paul Kariya and Teemu Selanne's point production significantly declined from the previous season – Kariya went from 86 points to 67 points and Selanne went from 85 points to 57 points. Selanne was subsequently dealt to San Jose at the trade deadline for Jeff Friesen, Steve Shields and a second-round draft pick, while head coach Craig Hartsburg was fired during the season. The team ended up with a losing record and last place in the Western Conference that season. Without Selanne, Kariya's numbers continued to drop in the 2001–02 season with new coach Bryan Murray. The Mighty Ducks finished in 13th place in the Western Conference. The Mighty Ducks did not reach the post-season again until the 2002–03 season with head coach Mike Babcock. They entered the playoffs in seventh place with a 40–27–9–6 record, good enough for 95 points. In the first round, the Ducks were once again matched up with the Detroit Red Wings, the defending Stanley Cup champions. They shocked the hockey world by sweeping the Red Wings in four games. Steve Rucchin scored the series-winning goal in overtime in Game 4. In the second round, the Ducks faced the Dallas Stars. Game 1 turned out to be the fourth-longest game in NHL history, with Petr Sykora scoring in the fifth overtime to give the Mighty Ducks the series lead. The Ducks would finish off the Stars in Game 6 at home. In the team's first trip to the Western Conference Finals, they were matched up against another Cinderella team, the sixth-seeded, three-year-old Minnesota Wild. Jean-Sebastien Giguere strung together three consecutive shutouts and allowed only one total goal in the series in an eventual sweep. The 2003 Stanley Cup Finals, to be played against the New Jersey Devils, had some interesting story lines. Anaheim forward Rob Niedermayer was playing against his brother Scott, while Giguere faced off against fellow French-Canadian goaltender Martin Brodeur. The series began with the home team winning the first five games. In Game 6 at home, Kariya was knocked out from a hit by Devils captain Scott Stevens. However, Kariya would return in the second period and score the fourth goal of the game. In an exciting third period, the Mighty Ducks defeated the Devils 5–2 to send the series back to New Jersey for Game 7. Anaheim, however, could not complete their winning streak, as they lost a hard-fought Game 7 to the Devils 3–0. For his brilliant play during the post-season, Giguere was awarded the Conn Smythe Trophy as the Most Valuable Player (MVP) of the playoffs. He became only the fifth player in NHL history to have won the trophy as a member of the losing team. Giguere posted a 15–6 record, 7–0 in overtime, with a 1.62 goals against average, a .945 save percentage and a record 168-minute, 27-second shutout streak in overtime. After the season, Kariya promised to bring the Mighty Ducks back to the Stanley Cup Final the following year. However, Kariya left the Ducks in the summer and joined former teammate Teemu Selanne on the Colorado Avalanche. The 2003–04 season was a season to forget, as Jean-Sebastien Giguere could not repeat his stellar goaltending from the previous year. Even with newcomers Sergei Fedorov and Vaclav Prospal, the team finished in 12th place in the standings with a 29–35–10–8 record. Giguere's stats subsequently declined from the previous season, as he only won half the games he did the year before, his goals against average increased from 2.30 to 2.62, his save percentage went down from .914 to .907 and he went from eight shutouts recorded to just three. The team also went from 203 goals to 174. During the summer of 2004, as the NHL and the National Hockey League Players' Association (NHLPA)'s labor dispute was headed towards a long lockout, Disney tried to sell the team but received a low offer of US$40 million, less than the franchise's original price. In 2005, Broadcom Corporation co-founder Henry Samueli of Irvine, California, and his wife Susan bought the Mighty Ducks from The Walt Disney Company for a reported US$75 million. The Samuelis pledged to keep the team in Anaheim. Brian Burke, former Vancouver Canucks general manager and president, was appointed general manager and executive vice-president of the Mighty Ducks on June 20, 2005. 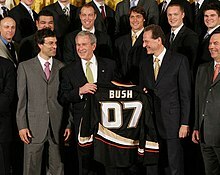 In January, Samueli announced the team would be renamed as simply the "Anaheim Ducks" as of the following season. Scott Niedermayer battles for the puck with San Jose Sharks' Scott Hannan in a game during the 2005–06 season; signed in the 2005 off-season, he was later named as team captain. On August 1, 2005, former Norris Trophy-winning defenseman Randy Carlyle was hired as the seventh head coach in team history. Burke was familiar with Carlyle's coaching ability, as the latter had coached the Manitoba Moose from 1996 to 2001 (International Hockey League) and 2004–05 (American Hockey League); the Moose had been the Canucks farm club since 2001. Carlyle replaced Mike Babcock, who later signed on to coach Detroit. On August 4, 2005, free agent defenseman Scott Niedermayer signed with the Mighty Ducks to play with his brother Rob; Scott Niedermayer was almost immediately named team captain. On August 22, Teemu Selanne returned to Anaheim after undergoing knee surgery. He led the team in scoring during the season with 40 goals and 50 assists for 90 points. He would also record his 1,000th NHL point on January 30, 2006. 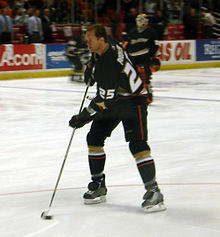 The 2005–06 season also saw the emergence of rookies Ryan Getzlaf, Corey Perry and Chris Kunitz (Kunitz also played for the Ducks in 2003–04, but immediately returned to the Mighty Ducks' AHL affiliate, the Cincinnati Mighty Ducks). On November 15, 2005, Anaheim traded Sergei Fedorov and a fifth-round draft pick to the Columbus Blue Jackets in exchange for defenseman Francois Beauchemin and forward Tyler Wright. The Ducks finished the season with a 43–27–12 record, good enough for 98 points and the sixth seed. The Ducks faced the Calgary Flames in the Western Conference quarter-finals and forced a seventh game in Calgary, shutting-out the Flames to reach the Conference semi-finals. In an interesting playoffs, all the bottom seeds won in the first round, so the Ducks matched-up against the seventh-seeded Colorado Avalanche. Goaltender Ilya Bryzgalov shined as the Ducks swept the Avalanche in four-straight games, Bryzgalov breaking Giguere's scoreless streak record from the 2003 Stanley Cup playoffs. In the franchise's second Western Conference Finals appearance, they faced the eighth-seeded Edmonton Oilers, a series the Ducks would ultimately lose in five games. Prior to the 2006–07 season, the Ducks adopted a completely new look to go along with their new name; their team colors became black, gold and orange, and the logo of a duck-shaped goalie mask was dropped in favor of the word "Ducks", with a webbed foot in place of the "D". The Ducks traded Joffrey Lupul, Ladislav Smid and a first-round draft pick to the Edmonton Oilers in exchange for star defenseman Chris Pronger. With this trade, solid scoring lines, a shut-down line featuring Rob Niedermayer, Samuel Pahlsson and Travis Moen and an enviable defense, the Ducks were considered by many to be a Stanley Cup favorite. On November 9, 2006, the Ducks defeated the Vancouver Canucks 6–0 at General Motors Place in Vancouver to improve their season record to 12–0–4. The win set an NHL open era record by remaining undefeated in regulation for the first 16 games of the season, eclipsing the previous mark set by the 1983–84 Edmonton Oilers (the record has since been broken by the Chicago Blackhawks' 21–0–3 start during the 2012–13 season). Anaheim were subsequently shut out by the Flames the following game, 3–0, ending their streak. On January 16, 2007, the Ducks played in their franchise's 1,000th regular season game, and on March 11, the Ducks recorded their franchise's 1,000th point with a 4–2 win over the Canucks, which improved their franchise all-time record to 423–444–155, with 1,001 points. On April 7, the Ducks won their first division title in franchise history when the Canucks defeated the second-place San Jose Sharks in the final game of the season. The Ducks ended the regular season with a 48–20–14 record and 110 points—both franchise records. Although they had three fewer wins than the Nashville Predators, the Ducks won the second seed in the West by virtue of winning the Pacific Division title as well as the Predators finishing second in the Central Division behind the Detroit Red Wings (the top seed in the West). The Ducks defeated the Minnesota Wild in the Conference quarter-finals in five games and the Canucks in the semi-finals, also in five games. Once again, the Ducks faced the Detroit Red Wings in the franchise's third trip to the Western Conference Finals. In Game 3, Chris Pronger elbowed Tomas Holmstrom and subsequently received a one-game suspension for the illegal check. However, the Ducks won Game 4 without Pronger and Game 5 in Detroit, with Teemu Selanne scoring the latter game's overtime winner. The Ducks then finished off the Red Wings in Game 6 to advance to their second-ever Stanley Cup Final appearance. In the Finals, the Ducks won the first two games at home against the Ottawa Senators. However, the Ducks lost Game 3 and Pronger received his second one-game suspension, this time for elbowing Dean McAmmond. The Ducks were again able to win without Pronger, defeating the Senators in Game 4 for an opportunity to win the Stanley Cup on home ice in Game 5. On June 6, the Ducks defeated the Senators 6–2 at Honda Center to claim their first Stanley Cup in franchise history. Travis Moen was credited with the Cup game-winning goal. Scott Niedermayer, the only player on the team who had previously won a Stanley Cup, was awarded the second Conn Smythe Trophy in Ducks history. The Ducks became the first California team, and the fourth West Coast team since the 1915 Vancouver Millionaires, 1917 Seattle Metropolitans and 1925 Victoria Cougars, to win the Stanley Cup. The Ducks began their title defense in the 2007–08 season without two fan favorites, Scott Niedermayer and Teemu Selanne, who were both contemplating retirement. To offset those losses, Burke signed forward Todd Bertuzzi and defenseman Mathieu Schneider. During the season, Burke put goaltender Ilya Bryzgalov on waivers, where he was picked-up by the Phoenix Coyotes. Free agent signee Jonas Hiller then became the back-up to starter Jean-Sebastien Giguere. Both Selanne and Niedermayer would ultimately return and the team finished with a 47–27–8 record, good enough to earn home ice advantage in the first round of the playoffs finishing as the fourth seed in the Western Conference. They were eliminated in the quarterfinals in six games by the Dallas Stars. In the off-season, Burke bought-out the remaining year on Todd Bertuzzi's contract and traded Mathieu Schneider to the Atlanta Thrashers. Saku Koivu of the Ducks, and Henrik Sedin of the Vancouver Canucks, face-off during a game in the 2009–10 season. The Ducks signed Koivu during the 2009 off-season. After an extremely slow start to the 2008–09 season, on November 12, 2008, Burke resigned to take the same position for the Toronto Maple Leafs. Bob Murray replaced him as general manager, but the team struggled to make the playoffs as the eighth seed in the Western Conference. A bevy of trade deadline deals saw the departure of some mainstays from the Cup team, including Chris Kunitz, who was traded to the Pittsburgh Penguins for defenseman Ryan Whitney; Samuel Pahlsson, who was traded to the Columbus Blue Jackets for defenseman James Wisniewski; and Travis Moen, who was traded to the San Jose Sharks for two prospects. The trades gave the Ducks new life as a hot streak to end the season launched the team into the playoffs. Jonas Hiller emerged as the new number one goalie during the stretch drive. The Ducks defeated the number one seed and Presidents' Trophy-winning San Jose Sharks in six games in the first round before being eliminated in the conference semi-finals by the eventual Western Conference champion Detroit Red Wings in seven games. Before the 2009–10 season, the Ducks traded Chris Pronger to the Philadelphia Flyers for Joffrey Lupul, Luca Sbisa and two first-round draft picks. Francois Beauchemin and Rob Niedermayer also left via free agency for the Toronto Maple Leafs and New Jersey Devils, respectively. The Ducks then signed free agent center and former Montreal Canadiens captain Saku Koivu to a one-year deal. Another slow start would doom the Ducks. Before the trade deadline, the Ducks traded Giguere to the Toronto Maple Leafs for Jason Blake and Vesa Toskala after signing Hiller to a contract extension. The trade deadline saw the Ducks trade Ryan Whitney to Edmonton for offensive defenseman Lubomir Visnovsky, as well as the acquisitions of defenseman Aaron Ward from the Carolina Hurricanes and goalie Curtis McElhinney from the Calgary Flames. The Ducks played through frequent injuries and picked up play in the second half of the season, but struggled coming out of the Olympic break. For the first time since the lockout, the Ducks failed to make the playoffs with a 39–32–11 record. The 2010 off-season was also busy for the Ducks, as Scott Niedermayer announced his retirement in a June press conference. Niedermayer decided to stay a member of the Ducks as a team consultant. The Ducks resigned Saku Koivu for two years and signed free agent defenseman Toni Lydman to a three-year contract. In addition to Lydman, the Ducks were able to get defenseman Cam Fowler via the draft, and 35-year-old strong-willed defenseman Andy Sutton signed to a two-year deal. Restricted free agent Bobby Ryan was signed to a five-year deal. Ryan Getzlaf is the current team captain of the Ducks. Drafted by the team in 2003, he was named team captain in 2010. The 2010–11 season did not begin well for the Ducks, who would lose their first three games. They maintained a .500 throughout record through the first half of the season, but would find their rhythm and finish 47–30–5, good for 99 points and fourth place in the Western Conference. Corey Perry and Jonas Hiller represented the Ducks at the All-Star Game, and Corey Perry went on to have a 50-goal, 98-point season, which won him the Maurice "Rocket" Richard Trophy and Hart Memorial Trophy. He became the first-ever Duck to win the Hart, as well as the first Richard winner as a Duck since Teemu Selanne won the award in 1999. However, Hiller was injured at the All-Star Game and missed the rest of the season. Even though the Ducks had a great season led by Perry, Hiller, Selanne, Visnovsky and Getzlaf, they would end up losing in the first round of the 2011 playoffs to the fifth-seeded Nashville Predators. Before the 2011–12 season began, the team mourned the loss of former Mighty Duck Ruslan Salei, who died in a plane crash with several other former NHL players of Kontinental Hockey League (KHL) club Lokomotiv Yaroslavl. The team wore a black patch with his former jersey number, 24, in current team numbering. The Ducks started the season with NHL Premiere games in Helsinki and Stockholm. This was the third time in franchise history that they started the regular season with games in Europe. They lost 4–1 to the Buffalo Sabres in Helsinki but defeated the New York Rangers 2–1 after a shootout in Stockholm. After a slow start to the season, the Ducks replaced head coach Randy Carlyle with former Washington Capitals head coach Bruce Boudreau. The rest of the season was mostly forgettable, as the Ducks could not get out of the hole they dug themselves in the first half of the season, and ultimately failed to reach the playoffs in the 2011–12 season. Bruce Boudreau was the head coach of the Ducks from 2011 to 2016. He coached the team to four consecutive division titles. The 2012–13 season was shortened to 48 games due to a labor lockout. 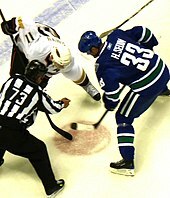 When play resumed in January 2013 after a new collective bargaining agreement was signed, the Ducks opened the season by sweeping a two-game Canadian road trip with a decisive 7–3 victory against the Vancouver Canucks on January 19, followed by a 5–4 decision against the Calgary Flames on January 21. Their home opener came on January 25, also against the Canucks, who would prevail 5–0. The distinction of the Ducks' longest homestand was split between two five-game stretches from March 18–25 and from April 3–10. Anaheim's lengthiest road trip was a six-game haul from February 6–16. Due to the shortened season and the compacted game scheduling, all games were to be played against the Ducks' own Western Conference opponents, and no games were played against Eastern Conference teams. The Ducks finished the season with a 30–12–6 record and would win their second Pacific Division title in franchise history. In the Western Conference quarter-finals, they ended up losing to the seventh-seeded Detroit Red Wings in seven games, despite holding a 3–2 series lead after Game 5. Entering the 2013–14 season, the 20th anniversary of the franchise, it was announced that Teemu Selanne would be playing in his final NHL season. In the off-season, star forward Bobby Ryan was traded to the Ottawa Senators in exchange for forwards Jakob Silfverberg, Stefan Noesen and Ottawa's first-round pick in the 2014 NHL Entry Draft, and the Ducks also signed defenseman Mark Fistric, center Mathieu Perreault and a returning Dustin Penner. Despite a bad start suffering a 6–1 mauling at the hands of the Colorado Avalanche, the Ducks followed the opener with seven-straight wins, a run which was repeated and surpassed twice more during the season, including a franchise-record setting ten consecutive wins from December 6 to 28, 2013. At one point of the season, the Ducks won 18 of 19 games, the longest run of one-loss play in the NHL for 45 years. 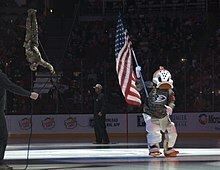 A 9–1 victory over the Vancouver Canucks on January 15 saw Anaheim establish a 20–0–2 record at the Honda Center, which matched the longest season-opening home points streak in 34 years, as well as setting a franchise-record for goals scored in a game (9), and powerplay goals scored in a game (6). Dustin Penner was eventually traded to the Washington Capitals, and prior to the NHL trade deadline, the Ducks acquired veteran defenseman Stephane Robidas from the Dallas Stars. Behind a Hart Trophy-caliber season from club captain Ryan Getzlaf, solid depth scoring, a steady if unspectacular defence and solid goaltending in the form of Jonas Hiller and rookie Frederik Andersen, many felt that the Ducks were primed to be a top contender for the Stanley Cup. The Ducks remained towards the top of the NHL standings for the entire season, ending the regular season with a franchise-best 54–20–8 record (116 points) and eventually finishing one point behind the Boston Bruins in the race for the Presidents' Trophy, awarded to the team finishing the regular season with the best record. The Ducks secured a second consecutive Pacific Division title and the number one seed in the Western Conference. Anaheim faced the eighth-seeded Dallas Stars in the Western Conference quarter-finals and were victorious in six games, marking the first time since 2009 that the Ducks had won a playoff series. In the Western Conference semi-finals, the Ducks faced their geographic rival and eventual Stanley Cup champion Los Angeles Kings for the first time ever in the playoffs. In a hotly contested series, the Ducks ultimately went down in seven games to their Southern Californian rivals, losing Game 7 by a score of 6–2 at the Honda Center. On June 27, 2014, the Ducks acquired center Ryan Kesler and a third-round pick in 2015 from the Vancouver Canucks. In the following season, they would win their third-straight Pacific Division title and finish as the top seed in the West with 109 points. In the 2015 playoffs, they swept the Winnipeg Jets in the first round and beat the Calgary Flames in five games to set up a Western Conference final against the Chicago Blackhawks. After taking three games to two series lead on the strong play of goaltender Frederik Andersen, the Ducks lost the final two games of the series, including Game 7 on home ice. This marked the third-straight season the Ducks had lost a series in Game 7 at home after leading the series three games to two. On July 15, 2015, the Ducks signed Ryan Kesler to a six-year contract extension totaling a reported $41.25 million. Just prior to the 2015 NHL Entry Draft, the Ducks sent Emerson Etem and a draft pick to the New York Rangers in exchange for speedy left-wing Carl Hagelin. They also traded for Vancouver Canucks defenseman Kevin Bieksa and adding veterans Shawn Horcoff, Chris Stewart and Mike Santorelli. Entering the 2015–16 NHL season, many analysts pegged the Ducks as Stanley Cup favorites. However, scoring struggles led to a slow start, with the team still out of a playoff spot in December. The team improved afterwards riding the goaltending of John Gibson. On March 6, 2016, the Ducks set a franchise record with an 11-game winning streak which ended the following night. On March 24, 2016, the Ducks clinched a playoff spot in a 6–5 overtime loss to the Maple Leafs. However, in the first round of the playoffs, they fell in seven games to the Nashville Predators, which led to the firing of head coach Bruce Boudreau. On June 14, 2016, the Ducks announced they re-hired former head coach Randy Carlyle. On May 10, 2017, the Ducks ended their Game 7 losing streak when they defeated the Edmonton Oilers, winning the series 4–3 and advancing to the Western Conference finals for the second time in three seasons. They would fall to the Nashville Predators in Game 6, ending their playoff run. In the following season, the Ducks failed to win the Pacific Division for the first time since the 2011–12 season. They clinched the playoffs, but were swept by the San Jose Sharks in the First Round. Founded in 1993, the then-called Mighty Ducks of Anaheim were directly named for The Mighty Ducks movies. When The Walt Disney Company, which produced the movies and owned the NHL team, sold the team in 2005, the name was shortened to its current state, "Anaheim Ducks." The Ducks have officially worn three unique regular jerseys and five unique third jerseys in their franchise history. The original jerseys of the Ducks (then the Mighty Ducks) used jade green, purple, white and grey as primary colors for both the home and away jerseys. The team's dark jerseys were dominantly purple in color with diagonal gray and white stripes; the jersey is jade green below the stripes, which appear on the arms and waist, and the collar was jade and white. The white jerseys were similar, except that the purple is replaced mainly with white and the collar is completely purple in color. In 1996, shoulder patches were added to both jerseys featuring a forward-facing version of the main logo's "duck mask", surrounded by a circle reading "Mighty Ducks of Anaheim". The hockey pants also had a jade stripe on the sides that was eliminated after the Ducks' 2003 Stanley Cup run and heading into the 2003–04 season. Anaheim Ducks jerseys used during the 2006–07 season. The same design was used when the whole league went to a new jersey template the next year. About a year after the team was purchased from the Walt Disney Company by the Samuelis, Brian Burke initiated a name change dropping the "Mighty" after consultation with the fans showed that the typical fan had a willingness to update the "Mighty Ducks" name and jersey and also a desire to keep part of the traditions of the franchise. Burke sought inspiration for the jersey from the United States Military Academy, ending up with diagonal gold, white, black and orange stripes down the arms and waist with the word "Ducks" on the front. The jersey is similar to the team's most recent third jersey prior to the name change. The orange pays tribute to Orange County, where Anaheim is located. For the 2007–08 NHL season, the Ducks, like all NHL teams, changed over to new Reebok Edge jerseys. The new team jersey shows only minor modifications from the 2006–07 season's jerseys, including a small NHL crest just below the neck, and a smaller ducks logo on the chest. After the first year of the Edge uniform system being in place, the Ducks increased the size of their logo. The Ducks would use these uniforms as their primary uniforms until the 2013–14 season. On June 27, 2014, the Ducks unveiled their new uniforms that were based on the 2010–2014 alternate jerseys. Changes to the collar and number font were included. The third jerseys of the Ducks were created in 1995, 1997, 2003, 2010, 2015 and 2018. The 1995 jersey was jade green with purple and white stripes on the collar and on the end of the sleeves. The logo was of team mascot Wildwing wearing a Mighty Ducks jersey while breaking through a sheet of ice. The jersey was short-lived; as severe criticism encouraged management to retire the jersey at the end of the 1995–96 season. Ducks alternate logo (2010–present). This is currently used as a patch on the Ducks' home and away jerseys and features the original Mighty Ducks logo. The 1997 third jersey came with a rare fourth jersey partner. The third was a jade green-colored jersey with silver and purple stripes at the shoulders outlined in thin yellow, and a silver stripe at the bottom. It had the Mighty Ducks logo in the center of the chest. The fourth jersey was much like it. It was white with jade green, purple, and silver stripes at the shoulders of the jersey, but no bottom stripe. These jerseys saw action until the end of 1999–2000, when they stopped playing with their third jerseys, and used only the fourth. At the end of 1999–2000, the fourth was also retired. The 2003 third jersey was black with purple and gray stripes at the waist and on the sleeves. It had the alternate script logo of the present Mighty Ducks and old-style laces at the neck, as well as a shoulder patch displaying an interlocking "MD" (for "Mighty Ducks"). The popularity of this jersey amongst fans was so great it replaced the purple and jade jersey, serving as the home jersey for the last half of the 2005–06 season and playoffs. It was dropped following the season as the team went to a modified name, new uniforms, and color scheme; however, this popular jersey influenced the design of the new jerseys for 2006–07. It was the only time in the modern NHL days when a mainly black jersey was not worn with black pants; instead, the pants were purple. The 2010 third jersey was officially unveiled on November 26, 2010, against the Chicago Blackhawks, the day after Thanksgiving. The jersey features the webbed "D" on the chest with the recolored Mighty Ducks logo on each shoulder. It features striping similar to the regular uniforms, and orange is much more prominent as a secondary color. In June 2014, the third jersey was made as the Ducks' primary home jersey, alongside a white one in the same style for away. On October 16, 2015, the Ducks unveiled a brand new, orange third jersey when they went up against the Colorado Avalanche. This jersey brought back the old Mighty Ducks logo and features a black collar with the "Anaheim" wordmark on the left side, the webbed "D" logo on the shoulders, and unique stripes that goes along with the teams home socks. For their Stadium Series game on January 25, 2014, the Ducks created a special jersey. This jersey is primarily orange with black lettering and numbers. The chromed Ducks logo, designed for the Stadium Series, is on the chest. There are gold, black and white stripes on the sleeves as well as black trim around the bottom and sleeves. The jersey has old fashion black lace on the neck and also has a unique "OC" logo on the left shoulder to represent Orange County where the Ducks are from. The Ducks announced for their 25th anniversary season of 2018–19 the adoption of a new third jersey that features the franchise's original colors of eggplant and jade. The current wordmark logo for the Anaheim Ducks. The team's colors were purple and jade until the change of ownership in 2006. At this point, they became orange, black and gold, with white in place of black for the away jersey. The only exception is the alternate jersey, which is mostly orange. Orange, which has become one of the team's primary colors, is in reference to Orange County, where Anaheim is located. The Ducks' logo features a webbed foot forming a "D". The text itself is gold (which sometimes may appear as bronze as well) with orange and black accents (forming a three-dimensional appearance). The entire logo is in turn outlined by silver. This is shortened from a prior version that spelled out the word "Ducks" in all capital letters. The old logo of the Ducks prior to the name change featured an old-style goaltender mask, shaped to form the appearance of a duck bill. Behind the mask are two intersecting hockey sticks, a black hockey puck, and a triangle; the color of the triangle was either green or gray, depending on how the logo is used. This is now used on a shoulder patch of the current uniforms, with the triangle in orange. The official mascot for the Anaheim Ducks is an anthropomorphized duck by the name of Wild Wing. He has been the team's mascot since its inaugural season, and his name was chosen through fan voting. He wears a Ducks jersey with the number 93 on the back, referring to the year the Ducks became an NHL team. Wild Wing with members of the California National Guard prior to the ceremonial first puck. He regularly descends from the rafters of the arena when making his in-game entrances. In one such descent the rigging that lowered Wild Wing from the rafters malfunctioned leaving the mascot trapped fifty feet above the ice for several minutes. Another well known blunder occurred in October 1995 when Wild Wing, attempting to jump through a "wall of fire", accidentally tripped causing the mascot to land on the fire and set his costume ablaze. His physical appearance is similar to the duck mask in the original Mighty Ducks logo. A bronze statue of Wild Wing was located outside the south doors of Honda Center from 1993 to 2012, until construction began on the 'Grand Terrace' addition to the arena. When construction was completed and the Grand Terrace opened in October 2013, the statue was noticeably absent. The mascot's name was also used for the leader of the Ducks, Wildwing Flashblade, in Disney's Mighty Ducks cartoon series. During the same time in which the team announced a name change as well as change in jersey designs, there was an attempt by the team's owners to change or replace the mascot, Wild Wing, but was halted after a highly successful petition by fans. The Mighty Ducks also used a secondary "mascot", a person (with no particular costume) called "The Iceman", during the team's first game in 1993. "The Iceman" appeared occasionally in the stands, played an electric guitar, and attempted to liven up the crowd. However, "The Iceman" was poorly received by fans and was quickly eliminated as the Ducks lost to the Red Wings in their inaugural game, 7-2. This is a partial list of the last five seasons completed by the Ducks. For the full season-by-season history, see List of Anaheim Ducks seasons. The Anaheim Ducks currently have three retired numbers, Teemu Selanne's no. 8, which was retired on January 11, 2015, before a game against the Winnipeg Jets, Paul Kariya's no. 9, retired on October 21, 2018, before a game against the Buffalo Sabres, and Scott Niedermayer's no. 27 on February 17, 2019, before a game against the Washington Capitals. 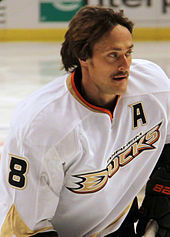 Selanne wore number 8 for 14 of his 15 seasons with the Ducks, he would wear number 13 during the 2005–06 season before returning to number 8 from the 2006–07 season onward. Former Ducks who have been inducted into the Hockey Hall of Fame. Teemu Selanne is the franchise's all-time leading goalscorer with 457 goals. Selanne is also the franchise's all-time points leader, and second all-time assists leader. Television broadcasts are on Fox Sports West or Prime Ticket, as well as KCOP for scheduling conflicts. Radio broadcasts are on KLAA AM 830, and The Mighty 1090 when the Los Angeles Angels are being broadcast on KLAA. Local air broadcasts were formerly on KDOC-TV. Disney planned to start an ESPN West regional sports network for the 1998–99 season, which would also carry Anaheim Angels baseball games, but the plan was abandoned. ^ "Staff Directory". AnaheimDucks.com. NHL Enterprises, L.P. Retrieved April 18, 2017. ^ "Anaheim Ducks Officially Take Flight". AnaheimDucks.com (Press release). NHL Enterprises, L.P. June 21, 2006. Retrieved April 18, 2017. In addition, a classic color palette of black and metallic gold was developed, with an accent of orange as a metaphorical link to the teams' Orange County home. ^ Norwood, Robyn (October 21, 2004). "Mighty Ducks Hire Ferreira as General Manager". Los Angeles Times. Retrieved 2014-05-01. ^ "Mighty Ducks fire Ron Wilson as coach". Canoe.ca. May 20, 1997. Retrieved 2014-05-01. ^ Norwood, Robyn (May 30, 1991). "Ducks Are Already Defensive : Hockey: Goalies Hebert and Healy are first players taken by Anaheim in expansion draft". Los Angeles Times. Retrieved 2014-05-01. ^ "Former NHL player Paul Kariya announces retirement after post-concussion symptoms". ESPN. June 29, 2011. Retrieved 2014-05-01. ^ Penner, Mike (January 2, 1994). "1993: The Year in Review. The Mighty Ducks Steal the Show : Ducks: Diamond in a Rough Year". Los Angeles Times. Retrieved 2014-05-01. ^ Norwood, Robyn (August 16, 1996). "THE NHL : Epilogue : The Kings and Mighty Ducks Have at Least One Thing in Common-They Are Two of the 10 Teams That Managed Not to Qualify for the Stanley Cup Playoffs. Yet the Assessment of Their Seasons Says a Lot About the Teams-One That Surpasses All Expectations, and Another That Lived Up to None. : MIGHTY DUCKS : They Had to Climb a Matterhorn, but They Were a Real NHL Team". Los Angeles Times. Retrieved 2014-05-01. ^ LARRY LEBOWITZ Business (March 16, 1997). "The Wide (disney) World of Sports". Sun-Sentinel. Retrieved 2014-05-01. ^ Brown, Frank. For Ducks, There's No I in Teemu. Daily News (New York). February 12, 1996 [Retrieved 2011-07-08]. ^ Farber, Michael. Stuck Duck. Sports Illustrated. December 3, 2001 [Retrieved 2011-07-28]. ^ National Hockey League. 1995–1996 Regular Season [Retrieved 2011-07-09]. ^ Anaheim Ducks. Ducks History – Captains and Coaches [Retrieved 2011-09-01]. ^ Ducks entering unfamiliar waters. Sun Journal. April 16, 1997 [Retrieved 2011-07-13]. Associated Press. ^ "Mighty Ducks fire Ron Wilson as coach". Canoe.ca. 1997-05-20. Retrieved 2016-09-27. ^ Jack Thompson (1998-06-16). "Mighty Ducks Change Again, Fire Coach Page After 1 Season – tribunedigital-chicagotribune". Chicago Tribune. Retrieved 2016-09-27. ^ "Ducks' Failure to Pick Up the Pace Led to a Stumble – latimes". Los Angeles Times. 2000-04-10. Retrieved 2016-09-27. ^ "Ducks history and fun facts". Ocregister.com. Retrieved 2016-09-27. ^ "Name change set for Mighty Ducks". Ocregister.com. Retrieved 2016-09-27. ^ "O.C. colors Ducks' new look". Ocregister.com. Retrieved 2016-09-27. ^ "Off-ice official Laing balances hockey with police work". National Hockey League. 2007-04-20. Retrieved 2016-09-27. ^ Greg Beacham (2014-01-17). "Ducks soar to top of NHL with 18 wins in 19 games". Yahoo!. Retrieved 2016-09-27. ^ Ducks, Anaheim (June 27, 2014). "Ducks Acquire Ryan Kesler". Anaheim Ducks. Retrieved 2014-06-27. ^ "Ducks' mental will is lacking in another Game 7 loss". Los Angeles Times. May 30, 2015. ISSN 0458-3035. Retrieved 2015-06-02. ^ "Ryan Kesler signs six-year contract extension with Anaheim Ducks". Retrieved 2015-07-17. ^ Halford, Mike (2015-12-12). "Getzlaf rips his team for lack of professionalism – ProHockeyTalk". Nhl.nbcsports.com. Retrieved 2016-09-27. ^ "Ducks' Gibson named Rookie of Month for December". National Hockey League. January 4, 2016. Retrieved January 5, 2016. ^ "Ducks set franchise record with 11th straight win". theScore. March 6, 2016. Retrieved June 14, 2016. ^ "Ducks' win streak ended by Washington Capitals in shootout". Los Angeles Times. March 7, 2016. Retrieved June 14, 2016. ^ "Ducks clinch playoff spot in OT loss to Leafs". Fox Sports. March 25, 2016. Retrieved June 14, 2016. ^ "Ducks fire coach Bruce Boudreau after Pacific Division title, playoff loss". ESPN. April 29, 2016. Retrieved June 14, 2016. ^ "Ducks Name Carlyle Head Coach". National Hockey League. June 14, 2016. Retrieved June 14, 2016. ^ "Ducks beat Oilers to end home Game 7 heartbreak, advance to West final". USA Today. May 11, 2017. Retrieved May 24, 2017. ^ a b Marrazza, Dan (June 14, 2016). "How NHL Teams Got Their Names". NHL.com/GoldenKnights. NHL Enterprises, L.P. Retrieved May 4, 2018. Founded in 1993, the then-called Mighty Ducks of Anaheim were directly named forThe Mighty Ducks movies. And until 2005, the NHL team and the movie Mighty Ducks shared a logo and colors, too. When Disney, which produced the movies and owned the NHL team, sold the team in 2005, the name was shortened to "Anaheim Ducks." Orange, which has become one of the team's primary colors, is in reference to Orange County, where Anaheim is located. ^ Anaheim Ducks. Anaheim Ducks 2006–2007 Media Guide. Anaheim, California: Ben Franklin Press, 2006. Page 41. ^ "Ducks to wear third jerseys in 2010-11". Ocregister.com. Retrieved 2016-09-27. ^ "Ducks Unveil 2014 Coors Light Stadium Series™ Jersey for Dodger Stadium Contest on Jan. 25 vs. Kings – Anaheim Ducks". National Hockey League. Retrieved 2014-05-01. ^ "Ducks reveal quacktastic third jersey for home opener". National Hockey League. July 21, 2018. Retrieved July 21, 2018. ^ "Mallard nests at The Pond". Ocregister.com. Retrieved 2016-09-27. ^ Pashelka, Curtis (April 18, 2018). "Broom service! Led by Martin Jones, Sharks sweep Anaheim Ducks". the mercury news. Retrieved April 20, 2018. ^ Semmler, Scott (August 18, 2011). "San Jose Sharks' 5 Biggest Rivals in the NHL". bleacher report. Retrieved December 21, 2015. ^ "Anaheim Ducks Roster". NHL.com. Retrieved October 3, 2017. ^ "Anaheim Ducks Hockey Transactions". TSN.ca. Retrieved October 3, 2017. ^ "Kariya, Niedermayer Jerseys to be Retired in Upcoming Season". National Hockey League. June 9, 2018. Retrieved August 13, 2018. Wikimedia Commons has media related to Anaheim Ducks.